When I was just dipping my toes into ecology, my undergraduate supervisor told me, “Always work locally if you can.” There are so many exotic places to do field work, but he thought that we should devote our energy and skills to our homes, where we are stakeholders as well as researchers. I am lucky that I have lived in places that are both gorgeous and interesting. While a resident of the Sidney-Victoria area in BC, one of my projects focused on Garry Oak ecosystems on the Saanich Peninsula. 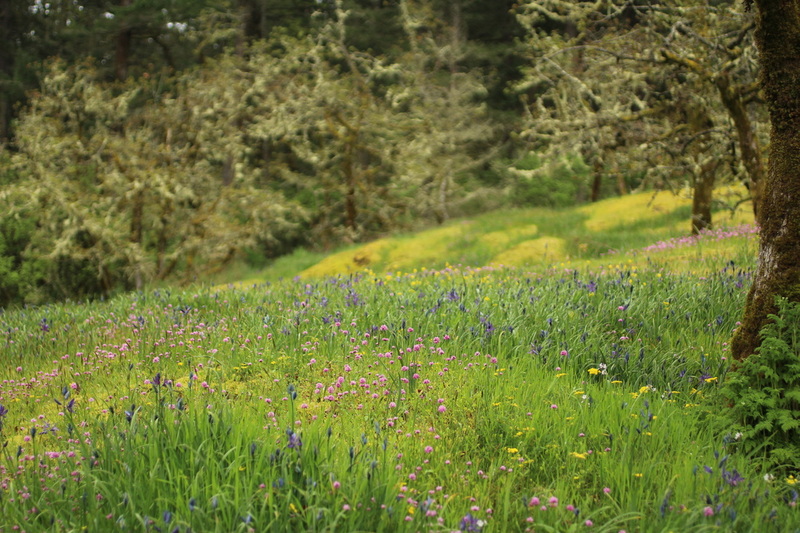 Garry Oak ecosystems are found across the Pacific Northwest and range from shady woodlands to open meadows. I work mostly in meadows with a sparse overstorey of oak and arbutus. In the spring time, these areas just erupt in color. The dominant understorey is often camas, a brilliant purple flower that is cultivated by First Nations here for its edible roots. 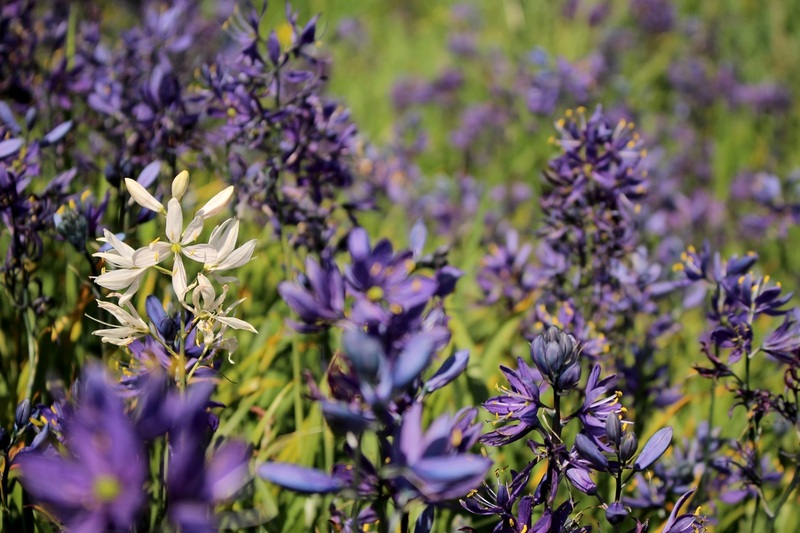 Scattered among the camas are pink seablush, white saxifrage, and yellow buttercup. 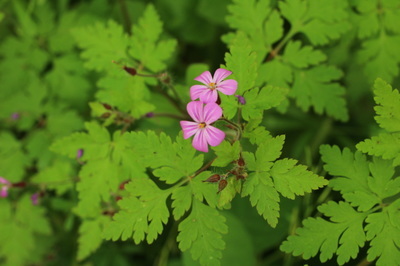 If you look even closer, you’ll find an assortment of annual flowers, tiny and diverse and beautiful. By summer, the color has faded and the meadow turns into a grassland. 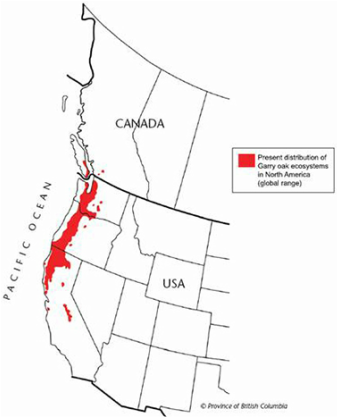 Range of Garry Oak ecosystems. Image from the Capital Regional District. There has been a pretty dramatic decline in Garry Oak ecosystem range since European settlement, with less than 5% remaining in near-natural condition. For deeper-soiled meadows, the open understorey was historically maintained by First Nations’ fire management. Most of these areas have either been converted for agriculture or the lack of fire has led to a transition to woodland. 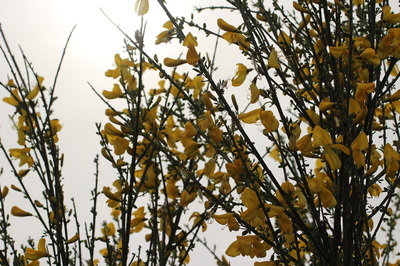 The shallow-soiled meadows have fared a bit better, but have undergone an onslaught of nonnative species, from woody shrubs like Scotch broom to perennial summer grasses like Velvet grass. These species are a pain to manage once they’re established; they often are prolific seeders, can survive in most environmental conditions, and have seeds that last decades in the soil. 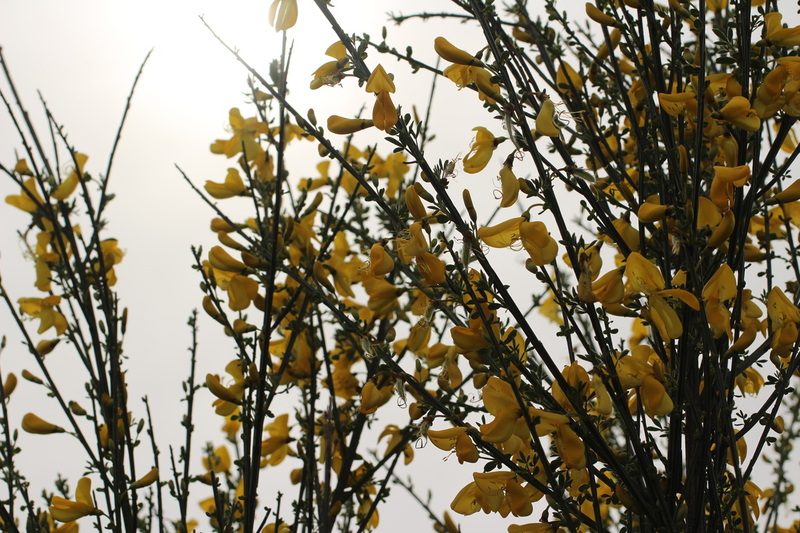 Management around here thus has focused on controlling the most invasive of these species. Victoria has committed community involvement, and I have met some wonderful volunteers and managers in these areas. 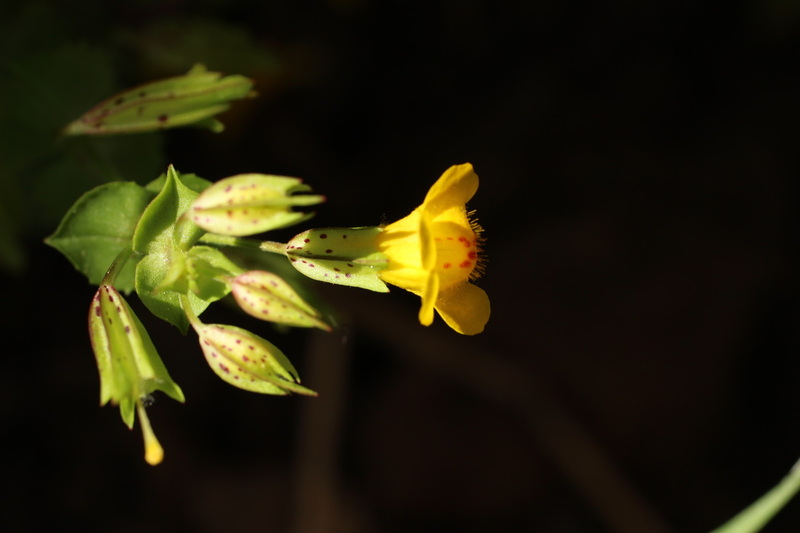 There is some sense, though, that when you pull up one weed, another moves in to take its place, and perhaps the changing species composition may in some way hint at what is to come with new global climate conditions. My project aimed at taking a step back and assessing what management of invasive species achieves for the ecosystem as a whole with a focus on patch-level structure, composition, and resilience. 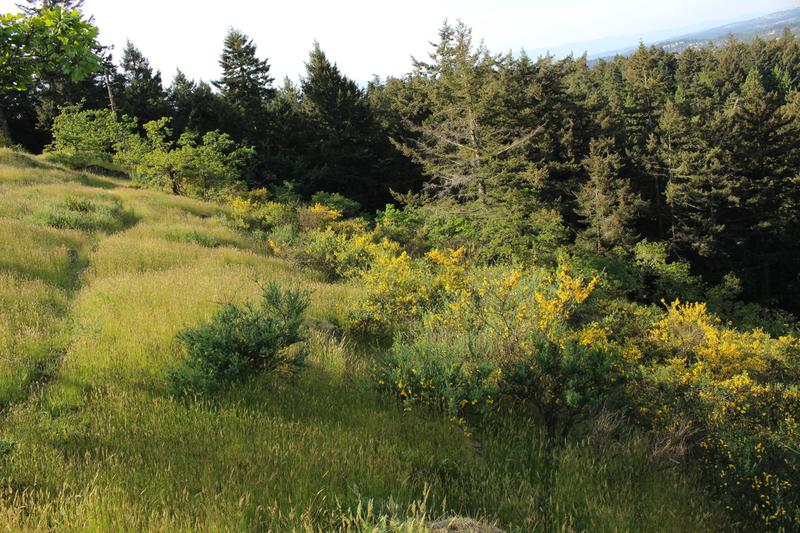 ​I resampled data first taken ten years in the local Garry Oak patches (Bennett et al, AWESOME work), allowing me to measure how much the species have changed, and what those changes imply for ecosystem functioning. I also worked with local managers to measure how much management effort went into each patch. When I matched up management effort against the changes we recorded, it revealed complicated patterns specific to each patch. In some instances, the savanna was lost to encroachment by native woody species. In others, the patches were so isolated that if a species was lost, there was no nearby patch to send seed over and replace it. Though invasive species control may be maintaining the status quo in many patches, it's clear that extra tactics are needed to see big ecosystem improvements. Some organizations have been discussing whether to refocus management efforts, and this work should shed light on what current efforts are achieving. On a broader scale, invasive species management is an enormous, endless restoration expense, and this project highlights the need to carefully consider its objectives and outcomes.